Buy a puppy….. Make sure you socialise it!!! You hear this from all the arm chair experts…. Even those who don’t have a dog…. But, what is it? What does socialise & habituation mean anyway? 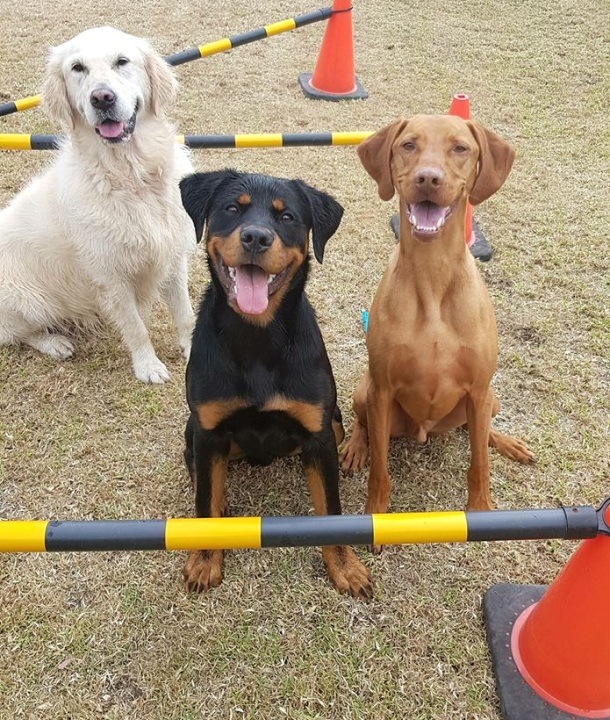 Socialising is the phrase commonly referred to for the practise of getting your dog used to being in all possible and potential environments and used to everything, anyone, and anything we may encounter in life. It’s kind of like learning to behave in a variety of social situations for humans…. Understanding the etiquette of certain environments, functions etc. Learning what is appropriate in the park vs the home… that sort of thing. So, now that you know what it means, why would you want to do it? 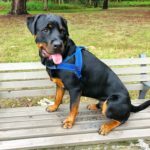 Because how boring would it be to be brought home, put in a kennel or back yard and left there forever….. Because life is exciting and an adventure….. Although we don’t encourage anthropomorphism (Anthropomorphism is the attribution of human traits, emotions, or intentions to non-human entities, e.g. treating animals like humans), for this one instance put yourself in the puppy or dog’s position and imagine, being born, brought home form the hospital, being put in your house and never leaving there! After a while the same rooms, yard etc. become really boring and you will seek some form of enrichment elsewhere…… it’s just average to feel like that….. Animals are the same…. staying in your backyard is boring and lacks enrichment, unless you live at Disneyland or something like that… and not many of us do!!! For dogs it serves another purpose other than relieving boredom…. Being accustomed to new environments, places, things etc. gives the dogs the ability & skills to cope with the stress of being in a new, strange place without freaking out….. As humans when we feel uncomfortable, stressed or scared we have the ability to say so… we can express ourselves by speaking our truth….. dogs can’t do the same… sure they show signs of stress but not many people outside the dog world are equipped to read these signs… and generally situations of anxiety and fear for dogs result in an instinctive “fight or flight” response…. This is the last response you would want from an adult working line dog or any dog for that matter…. which begs the question… when should this socialisation be carried out….. In short, As soon as you collect your puppy from the breeder!! By the time you receive your puppy it will be 8 weeks old, would have had its first vaccination and some initial experiences out and about. Now, many in the veterinary fraternity and other doggie types will tell you that until your dog has received its last shots it should not be taken out of your yard / home….. That would make the puppy about 16 weeks old, and at the end of its first “critical” development stage – and this is the decision you have to make as the puppy owner….. A trade-off of sorts….. Are you willing to risk your puppy’s development for the sake of a minimal potential of contracting a disease from being out and about? Avoid damp, dark areas of parks, streams, gullies etc. germs and viruses thrive in these types of environments, particularly parvo! Which happens to be your Rottweilers’ worst enemy during the vaccination phase…. 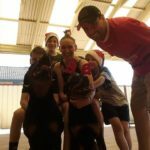 Now that we understand what socialisation is, why we need to do it and when we need to start, we need to understand who can / should do it…..
Socialising your puppy is something the whole family can be involved with, but it’s preferable that the majority of this activity is carried out by the primary handler / trainer of the puppy. It’s an opportunity & process that allows you to build the bond and rapport with your new puppy that will allow you to conquer any new place, task etc. 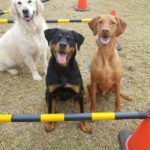 Socialising is quality “one on one” time with your puppy / dog that will contribute significantly to the relationship you create which in turn will contribute to your desired outcomes, be it on the trial field or in your home. 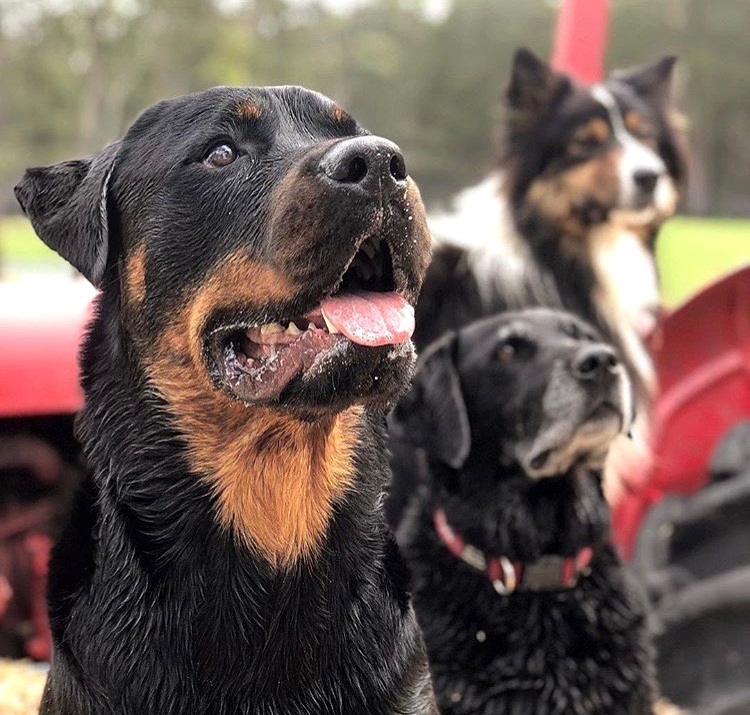 Dog training whether it be for trials, high level competitions or just following commands is about repetitions….. And socialising the way I prescribe will give you the opportunity for those repetitions to be completed. So, how do we do this socialisation thing?? I’m sure there are many ways to go about socialising your puppy and I’m not here to say which is right or wrong, better or worse…. I will describe how I go about it and hopefully this makes sense and provide some insight on how to accomplish it. If you have one take away from this articles let it be this: In your puppy/dog’s eyes there should be nothing other than you!! All things good, interesting and exciting should be YOU as far as your puppy is concerned…. There should be nothing other than this! All else should just be neutral. Take note: If your puppy is not interested in you and what you bring to them, then you have nothing! So, in saying that, have a think about how you can make yourself all that… sounds difficult? Not really, not when you understand what drives your puppy…. What motivates your puppy….. Other than the air they breathe the next important thing is food & water, which they depend on for their existence…. Feeding and the management of food (when and how they get it) is the best and most effective tool in your toolbox for training and building the relationship with your dog. Dogs are a pack animal and they enjoy being with you, however this is conditional on them having a good time with you…. If it’s not fun and productive (in their eyes) why would they want to be with you? New experiences, people, events etc. have the potential to be stressful or adverse events depending on how they are perceived by your puppy…. The good news is that you can have a positive effect on this potential and turn it into a positive event! Let’s break it down like this….. Food and fun times makes for a positive experience, builds trust and creates a strong bond….. Dogs learn by association, they pair events together, into sequences of learning…. So, if an action or event creates a negative experience then the dog will not remember just the experience it will also “not forget” equally as strong the incident that led to that experience. Without delving into the realm of dog training for which I am not qualified (but do understand it) in simple terms what you need to remember is that any event that is followed by a positive experience will be regarded highly by your dog, and conversely, an event followed by a negative experience will be avoided in future… because nobody and no animal enjoy negative experiences….. Now, some dog trainers will start to scream “negative learning”, but I feel as this article is aimed at novice puppy people that concept is best left for another article….. Please don’t misconstrue the above table as a signal that I am for “purely positive” training methods – I am not – I am for balanced training, but as I said before this is not about dog training but about creating a powerful and positive outcome from your socialising activities. The reward can vary, it can range from a simple pat, voice inflection telling puppy they did well, food or toy reward. The frequency and dose of the reward must be randomised to avoid boredom & robotic responses and to keep the puppy interested. The key is to manage the puppy’s expectation – they must thrive on the expectation of the reward. At the end of this article you will find a socialising schedule that in its presented format may seem quite daunting…. Some may think, “How am I supposed to get through all that?” I’m here to tell you that if you simply spend some time with your puppy every day, building trust & bonding by going for walks, car rides, exploring new environments, playing at the park, playgrounds etc. you will accomplish the list in no time…..
Keeping in mind my puppy, likes me, trusts me and likes to be with me (because I pay with it, feed it etc.) 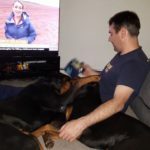 – and I think about the potential things I will encounter and have a deliberate strategy I will employ to overcome any negative experiences…..
I’m walking down the street with my puppy, a large truck roars past and gives the pup a fright (negative)…. soon as the puppy recovers (due to the superior Seeuferhause genetics) I give plenty of happy, high pitched praise and the puppy comes for a pat… puppy has now had a positive 2nd event and is back in a good frame of mind = positive outcome! We’re in the playground, puppy shows an aversion to a piece of playground equipment (negative)… I bring the puppy to the equipment and feed it some treats on or by the equipment (positive), puppy now wants to stay with the equipment = positive outcome! I’m with a group of children, they are noisy, running around, and screaming etc. puppy freaks out a little (negative)… I have the kids stop for a while, give them treats and bring the puppy to them so they can feed the treats, after some repetitions, the kids resume their playing, then we repeat the process of the treats (positive), the puppy then drags you to the children = positive outcome!! These are simple examples but it is intended to make you think how you can apply the concept of 1st event, 2nd event…. It’s simple… have fun with it! And then you can keep on doing it…. Keep on doing it? For how long? Never….. It should never end….. Do you ever stop going out? Do you ever say, right…. Time to lock the door and stay in for the next decade? NO… you don’t! So why do that to your pooch? Keep enjoying your puppy, keep doing the fun stuff, along with the serious training and keep fostering the relationship with your PUPPY!! 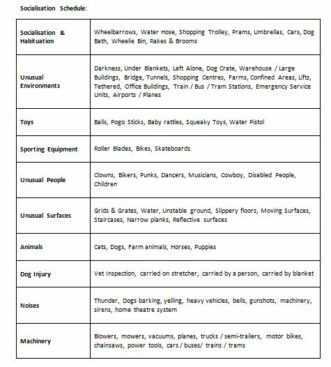 Below is a table developed years ago by a good friend of ours and it outlines a heap of ideas that you can enjoy with your puppy…. Use this as the start and add your own… have fun! Buying a puppy is not something that should happen without consideration as to the work required to raise, socialise and train a Rottweiler. 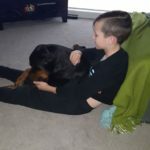 There is a lot that goes into the process and at Seeuferhause that starts with getting to know more about the people that would like one of our puppies – you can learn much more about our process by checking out our Buying a Seeuferhause Puppy page.